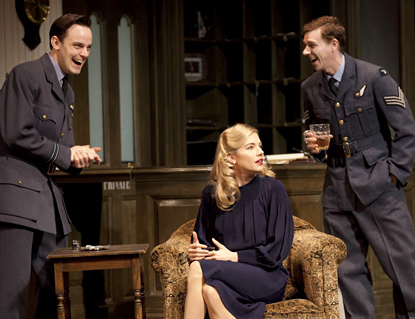 Just booked tickets to “Flare Path” in London for a couple months from now. It’s a romance set during WWII, involving at least one bomber pilot and at least one stalwart-but-torn woman, out of I think a total of two couples. It may be two bomber pilots and two stalwart women. B) It also stars Sheridan Smith, who is apparently very good. She just won an Olivier Award for Best Actress in Legally Blonde, which I confess I missed – I had heard she was amazing and the musical was good but could never quite bring myself to do it. So I’m glad to have the chance to check her out in something else. So you can count on getting an update on the future of the starlet(s)-driven play, as perceived by at least one C, here by the end of May. This entry was posted in Theatre, Upcoming and tagged Sheridan Smith, Sienna Miller. Bookmark the permalink.